So credit has a 8-10 x greater impact that housing supply. The report is flawed in many ways. If one were to look at the demand for housing alongside the supply on equal terms you need to look at the flow of housing demand alongide the flow of housing supply. There is endless stock-flow confusion in the way they derive the variables for model testing. You need for example to look at wages, interest rates and the flow of new credit together to determine the amount of money flowing into housing services. Similarly for the stock it is the rate of change of the stock that matters. The model similarly treats housing as a good like ice cream which is used up, rather than a store of value, and for that reason does not see the link between credit demand and the asset price of homes. They are not independent variables. Despite these flaws the story is clear and is unlikely to change with some stock flow consistent modelling. 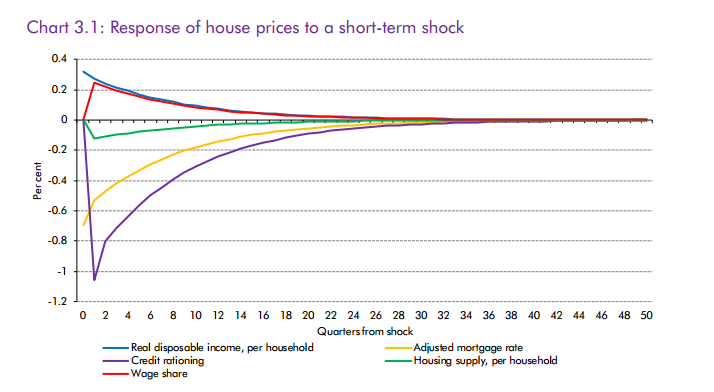 First it predicts a rapid sslowing og house price growth from mid-2015. by mid-2015, the rate of nominal house price growth in the model peaks. At the same time, the average mortgage rate begins to rise and the recovery in real income growth slows. 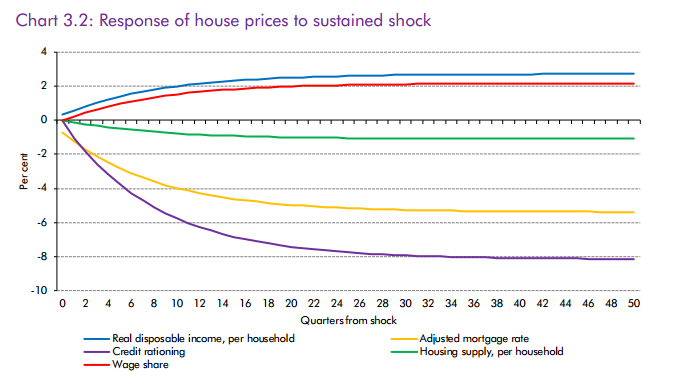 Together, these factors lead to a rapid rise in housing discount rate, more than the mortgage rate alone would suggest, and a steady deceleration of predicted house price growth.